If you have problems with postprandial glucose and insulin excursions, you should consider picking your burgers apart to be able to eat the carbs 10 minutes after you devoured the proteins and veggies... and yes, it's likely you'll skip the bun and reduce your overall energy intake, as well. If you're following my friend Alex Leaf on Facebook, you will have heard about the role of "nutrient order" (that's not "nutrient timing") as an important determinant of your postprandial glucose response. If you haven't heard about this, yet, let me briefly bring you up to speed: In a previous crossover study (Shukla 2017) involving metformin-treated subjects with T2DM, the authors of the study that's at the center of today's SuppVersity article have already demonstrated that the ingestion of the protein and vegetable components (e.g. tomato, onion, and salad leaf + burger patty) of a given meal 10 minutes before the carbohydrate components (e.g. 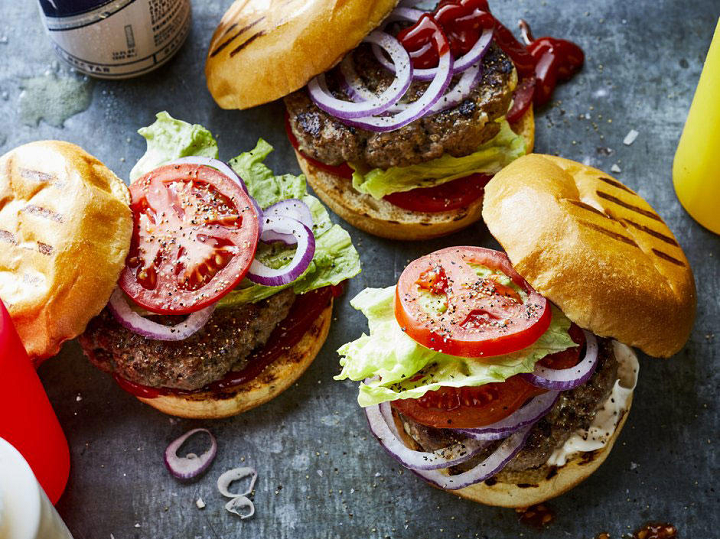 burger bun) will lower the postprandial glucose and insulin excursions over 180 min, compared to eating the same foods in the reverse order, or eating them all together (bye-bye sandwiches & burgers). Satiety: Casein > Whey? Wrong! that the meal order of vegetables first followed by protein and carbohydrate together (VF food order) will result in glycemic effects intermediate between PVF and CF. Male and female participants between 30 and 65 years of age, body mass index 25–40 kg/m² (that's overweight to obese), and with prediabetes (HbA1c 5.7-6.4%) were included in this study, which was registered only retrospectively in Clinicaltrials. gov (NCT03536364). Patients taking corticosteroids, antidiabetic medication, and patients with chronic renal or hepatic disease or history of prior bariatric surgery and pertinent food allergies were excluded. What did the scientists do with their fifteen pre-diabetic, overweight or obese subjects? In order to really isolate the effects of nutrient order, the scientists used a within-subjects crossover design (that's also why the low number of subjects, N=15, is not that much of a problem) in which all participants consumed isocaloric meals (Table 1) with exactly the same composition, on three separate days, 1 week apart, after a 12 hour overnight fast (physical activity and diet were to be kept unchanged throughout the study period and in particular on the day prior to each study visit). 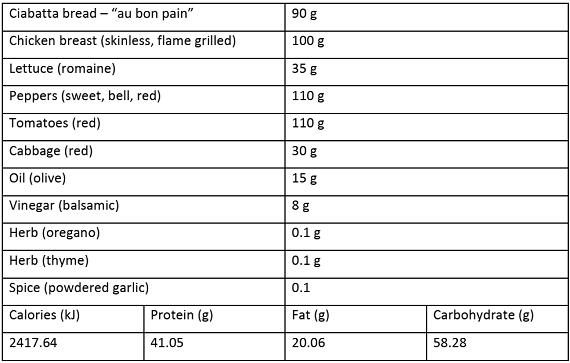 Table 1: Test meal composition for all subjects in Shukla 2018; the meals were prepared in the metabolic kitchen of the Clinical and Translational Science Center at Weill Cornell Medical College under the supervision of an RD. Carbohydrate first (CF) (ciabatta bread) over 10 min, a 10 min rest interval, and then protein (skinless grilled chicken breast) and vegetables (lettuce, tomatoes, bell peppers, red cabbage, with balsamic vinegar and olive oil) over 10 min. Protein and vegetables first (PVF) over 10 min, a 10 min rest interval, and then carbohydrate over 10 min. Vegetables first (VF) over 10 min, a 10 min rest interval, and then protein and carbohydrate together over 10 min. Yeah, you understand that correctly, the subjects were not allowed to eat like a normal human being in any of the trials. Shukla et al. probably simply assumed that the results of eating everything together would be identical to those observed in their previous study, i.e. Shukla 2017 where eating veggies, carbs, and protein together yielded only non-significantly better glucose and insulin values than the carbohydrates first approach - whether that's a reasonable assumption is IMHO as questionable as the idea that people who are in actual need of improving postprandial glucose and insulin levels will willingly compromise the enjoyability of their meals by eating the steak and broccoli first and gobbling down the fries 10 minutes later (keyword hedonic eaters). Ghrelin percent change from baseline following carbohydrate-first (carbs first), carbohydrate-last (carbs last), and sandwich meal orders. Values are mean ± SEM, n = 16. ¥ sign. 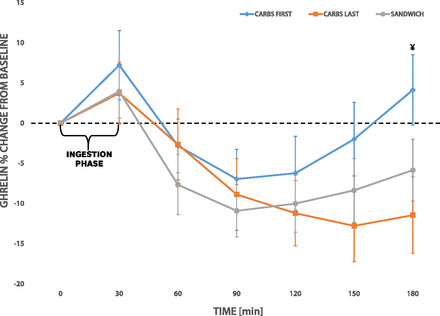 difference (P = 0.003, linear mixed-effects model) between carbs first and carbs last at 180 min (Shoukla 2018b). Carbs last is also best for the reduction of the hunger hormone ghrelin -- That's what Shukla et al. found in their first follow-up to their 2017 study in which they describe in a letter to the editor (Shukla 2018b) that a manipulation of macronutrient order can impact the excursions of the hunger hormone ghrelin in the way illustrated in the figure on the left. As you can see, eating the individual components of a sandwich on their own and leaving the carbs for last provides the most sustained reduction in ghrelin. You should keep in mind, though, that total ghrelin is a miserable predictor of how much you'll actually eat at the next eating occasion. You need the acyl-ghrelin levels which are not appropriately assessed by essays for total ghrelin (Castaneda 2010). If we assume, however, that someone actually adheres to this awkward and anti-hedonic nutrient order, it is well possible that the reduced palatability and joy of eating will have them eat less (especially carb skipping could become a thing) and lose weight, right!? So when you're having trouble losing weight, it's certainly worth considering to eat protein and veggies first and wait 10 minutes before you eat (or simply skip) the carbs. You can imagine that the average subject wasn't exactly thrilled to follow this awkward nutrient order, it is thus important to note that "the participants were closely monitored to ensure that the test meals were consumed in their entirety within the allotted time" (Shukla 2018). Figure 1: Postprandial glucose and insulin levels following, carbohydrate-first, protein and vegetables-first and vegetables-first meal orders. Values are mean ± SEM | ¥. p < 0.05 CF vs. PVF; Θ. p < 0.05 CF vs. VF (Shukla 2018). Based on these observations, the authors conclude their study demonstrates that the order in which the different parts of identical meals (foods, macros, calories identical) are consumed can have significant effects on overweight pre-diabetic subjects' glucose and insulin metabolism. and meal patterns (Shukla 2018). Suggested #SVClassic: Nutrient Timing Less, Cyclic Dieting & Baseline Microbiome More Important for Fat Loss - Nutrition Science News 02/18 | read the full article here. eating the carbohydrates first, on the other hand, will result in the largest glucose and insulin excursions and is by no means recommendable. Now, there are two things I would like the scientists to do in another follow-up study: (a) investigate if the same observations can be made in healthy, or even better, athletic subjects to know if people with a picture-perfect glucose metabolism will see similar benefits; and (b) let the subjects eat everything together - I mean wtf, they test everything but what a normal human being would do and you cannot simply assume that the results would be identical to the previous studies in type II diabetics (Shukla 2017) :-/ | Comment! Castaneda, T. R., et al. "Ghrelin in the regulation of body weight and metabolism." Frontiers in neuroendocrinology 31.1 (2010): 44-60. Shukla, Alpana P., et al. "Carbohydrate-last meal pattern lowers postprandial glucose and insulin excursions in type 2 diabetes." BMJ Open Diabetes Research and Care 5.1 (2017): e000440. Shukla, Alpana P., et al. "Effect of Food Order on Ghrelin Suppression." Diabetes care 41.5 (2018b): e76-e77. Shukla, Aplana O., et al. "The impact of food order on postprandial glycemic excursions in prediabetes." Diabetes Obes Metab. Accepted Author Manuscript (2018).